PLYMOUTH – At one point, it was 4-2 Livonia Stevenson. The Spartans had just scored three goals in five minutes during the middle of the second period to seize control of their state title game. 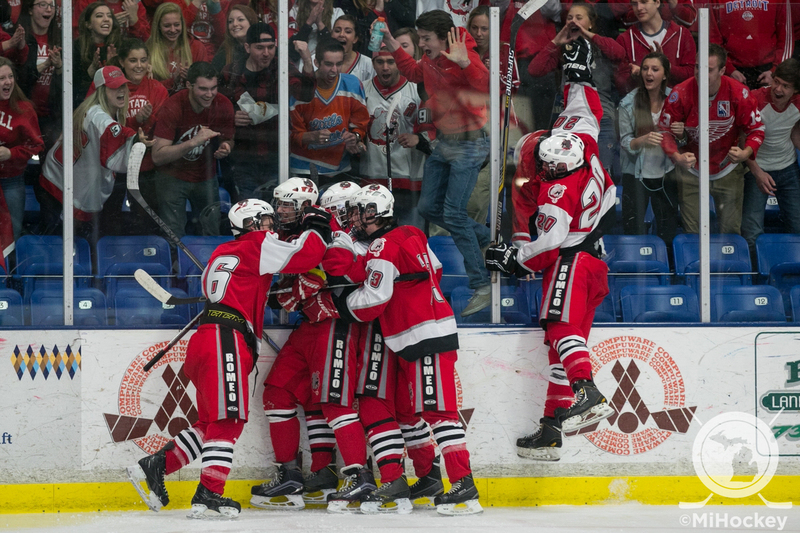 The Romeo Bulldogs had a different idea for how the game was going to end, however. Bulldogs coach Nick Badder – just 27 years old – called a time-out after the Stevenson flurry, and turned momentum around in time for his Bulldogs to score twice in the second period before taking the lead in the third. When the buzzer rang, the upset was complete – Romeo 6, Stevenson 4 at the Division 2 state title game in Plymouth. Badder said he reminded his team of what they talked about last night during the biggest timeout of the year for Michigan’s high school hockey season. “First one was heart, second one was focus and the third was stick together,” Badder said. “They all kind of matched up to the game. We were down, they had all the momentum. They had all the momentum and we were on our heels and we felt it. We just tried to calm the boys down. Once they calmed down and realized it was shift after shift we took over. Soon-to-be All-State nominee Logan Jenuwine recorded two goals and three assists in the contest, including the go-ahead goal at the 5:58 mark of the third period. The Bulldogs’ scoring leader got his stick on a shot from the point, redirecting it past goaltender Cullen Barber for the game-winner. The Bulldogs’ offensive force said that his team knew they were in good shape when they got out of the first period tied 1-1 with the favored Livonia Stevenson squad. “Everyone was nervous going in,” Jenuwine said. “We’ve never been in a big game like this. It was nice going into the locker room tied 1-1. We got all the nerves out. It was nice to come back as a 0-0 game. Brett Lanski scored two for the Bulldogs, while Luke Kaczor also found the back of the net. Nolan Kare stopped 29 shots to lead his team to a state title between the pipes. Joe Alcantara, Nick Beers, Shane Leonard and Nate Sudek scored for Livonia Stevenson, while Cullen Barber stopped 24 shots in goal. Romeo was the first team to strike, as Lanski took a pass from Jenuwine during a scramble in front of the Stevenson goal and he slid it past Barber for the game’s opening goal. Stevenson responded later in the first period on an impressive series of plays by Joe Alcantara. The Spartans’ No. 23 stole the puck just inside the Romeo blue line, set up Ben Kowalske for a scoring chance with a pass between a defender’s legs, then buried Kowalske’s rebound. The first period ended with a 1-1 score, and Stevenson holding the shot advantage at 9-7. Romeo was held scoreless on the lone power play of the opening frame, with Barber making two important saves on back-to-back tries by Blake Gabler from just outside the goal crease. The second period may have started slow, but it finished with a flurry of scoring. Romeo’s Jenuwine opened the scoring in the middle frame, firing a loose puck past Barber at the 10:41 mark while the Bulldogs were on a power play. 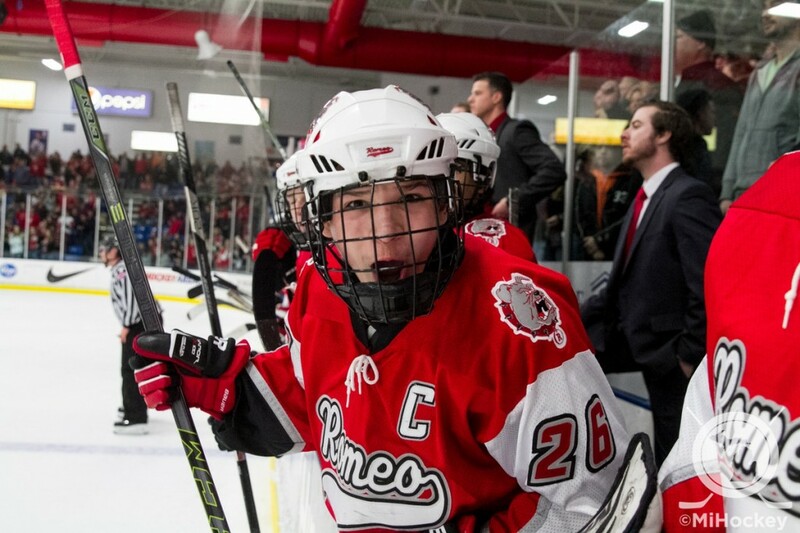 Less than 20 seconds later, Nick Beers split the Romeo defense to score on a breakaway, evening the score at 2-2. The Spartans struck quickly once again, as Shane Leonard redirected a pass from Adam Olson past Kare to give Stevenson its first lead. With 5:21 remaining in the second, Stevenson’s Sudek fired a shot off the crossbar and in to give the Spartans a 4-2 lead. Romeo stormed back, however, evening the contest before the second intermission. First, it was Lanski burying a feed from Jenuwine to make the game 4-3. Then, with 1:29 remaining, Kaczor tipped in a point shot past Barber to tie the game once again. The game took a turn for the worse for the Spartans in the third period when they were forced to try to kill off a five-minute major. Jake Beaune was given the five and a game penalty for head-butting Romeo’s Kaczor after he made contact with the Stevenson goaltender. On the ensuing power play, Jenuwine scored his second goal of the game, which turned out to be the difference-maker in the contest. Despite heavy pressure from Stevenson, Kare kept them scoreless in the third period, and Steven Morris added an empty-netter in the final minute to start the party early for Romeo.